This chart—begun in 2014 by Cameron Kroetsch, and finished in 2018 by myself (Liza Blake) and my RA Alaheh Amini1 —gives all the locations in which copies of Cavendish’s books survive. It is intended, first and foremost, as a resource for researchers, particularly those who might want to conduct bibliographical research on Cavendish’s work, and those who might want to produce scholarly editions. Any scholarly edition begins with a survey of surviving copies; we hope that the labor that went into this chart helps to save the step of locating those copies for future researchers and editors. Below I describe the methodology for putting the chart together, and give a brief sketch of noteworthy findings that came out of the project. To complete this chart, we looked for libraries that might hold copies on such databases as the English Short Title Catalog (ESTC), Worldcat, Copac, and the Union Catalog of France (CCFr). We also checked libraries with large rare book collections.2 Having developed a list of libraries, we combed through their online catalogs where such catalogs existed, and contacted libraries directly to ask them to verify holdings, and to check for uncatalogued copies on our behalf. I conducted a research trip to the UK in the summer of 2018, verifying copies in the British Library, Victoria and Albert Library, Sir John Soane’s Library, and Oxford and Cambridge libraries directly. Most other copies were verified by individual librarians. I will maintain and periodically update the chart as needed; please email me if you would like to suggest any changes or edits. Within the chart are 4 different sheets or tabs. The second tab, “Instructions,” includes instructions for use, further information about methodology, and contact information. The first tab, “Locations Chart,” gives in each cell the number of locations of each book in each research library. 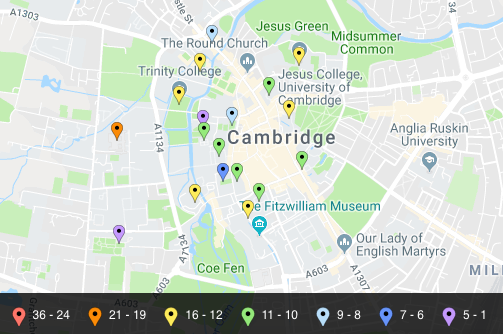 Figure 1: A screenshot of the “Locations Chart” tab, showing bands of works held in Oxford and Cambridge libraries. This first tab is particularly useful for visualizing the distribution of her works—the coherent bands of books held in Oxford and Cambridge college libraries is what initially prompted my research trip to the UK, as the presence of the same books across college libraries clearly indicated to me that they had been deliberately placed there. My research trip, during which I found fascinating binding patterns and donor inscriptions in Oxford and Cambridge copies, confirmed those suspicions; the article describing my findings is under development.3 As Figure 1 also shows, 1667 was the last year she gave works to both Oxford and Cambridge college libraries; while Cambridge received works published in 1668, those works are curiously absent from Oxford libraries—a pattern quickly evident from the chart. The “Locations Chart” tab is also useful for getting a quick sense of which of her texts survive in great numbers, and where. Including numbers of holdings in each cell allowed us to use Excel’s “SUM” functions to calculate totals, so one can easily see how many copies each library holds, and how many copies of each book survive. Figure 2: A screenshot of the chart showing holdings in other (non-Oxbridge) UK and Ireland Libraries, showing different densities of different holdings. As Figure 2 shows, some of her books exist in far greater numbers than others. For instance, there are several extant copies of her combination treatise and narrative fiction Observations upon Experimental Philosophy with The Description of a New World, Called the Blazing World (London, 1666; revised edition, London, 1668). However, she also published, in both 1666 and 1668, a standalone version of her proto-sci-fi utopia The Blazing World. This standalone volume circulated alone for, as she puts it in the prefatory materials, “ladies [who] take no delight in Philosophical Arguments.”4 As one can see from glancing at the chart, very few of these Blazing World standalone volumes survive: only 6 from 1666, and 4 from 1668. That so few copies of the standalone Blazing World survives either indicates the ephemerality of this “purely” literary text (unattached to the treatise’s systematic critique of empirical science), or perhaps indicates that we should take her at her word in her prefatory materials: while the utopia could travel solo, it was meant to be paired with the treatise.5 Perhaps the stand-alone Blazing World truly was a deliberately limited print run for only a few choice ladies. Her biography of her husband, on the other hand, the 1667 Life of the Duke, survives in no fewer than 99 copies. Figure 3: A screenshot of the “Shelfmarks and Call Numbers” tab. The “Shelfmarks and Call Numbers” tab is less useful for large-scale visualizations, but is designed to provide the practical information that researchers would need to call up Cavendish’s texts in individual archives. I have also found the shelfmarks helpful for understanding more about how libraries acquired the texts; those that were given as a batch, for example, tend to have similar or grouped call number runs, especially in those libraries whose shelfmarks still reflect original shelf locations (though many shelfmarks have been changed in the intervening centuries). Figure 4: Map of Cavendish library locations (showing North America and Europe). Using the City and Country columns and the website BatchGeo, I created an interactive map of Cavendish library locations. You can paste the data from the spreadsheet into BatchGeo to make your own version of that map to explore, though I will also show subsections and discuss parts of the map that the website generates below. Figure 5: Map of Cavendish library locations (showing Europe). 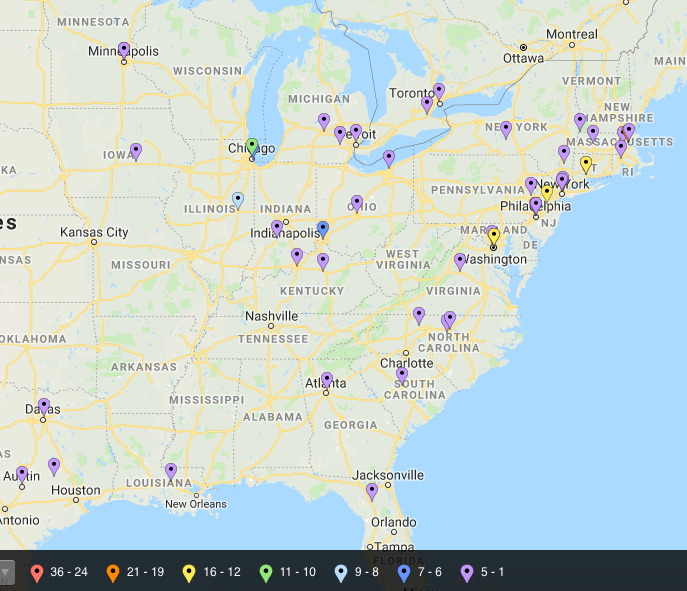 In the map, each marker represents a different library that holds at least one copy, and the color of the marker reflects the number of copies held in that library (the scale is visible in each image). Figure 5, which shows Europe, shows a fairly wide distribution of copies in Europe, and also all around England—which we would expect given that we know that she gave copies to friends in both England and abroad.6 The red and orange markers, which show particularly plentiful holdings, are not surprisingly in Cambridge, Oxford, and London, but the map also makes it possible to quickly and easily identify libraries with large numbers of Cavendish’s works. Figure 6: Map of Cavendish library locations (showing Cambridge). Zooming in on the map also reveals clusters of markers obscured by the distant view—so, for instance, Figure 6, the close-up of Cambridge, shows the large density of copies held there. The Cambridge University Library’s 19 copies stands out in orange, but most colleges hold 10–12 copies; both Oxford and Cambridge hold an astounding number of copies packed densely together. Figure 7: Map of Cavendish library locations (showing Eastern US and Canada). While the extreme density of copies in Oxford and Cambridge is one interesting finding of our survey, also fascinating is the spread or distribution of copies across the world. Glancing at the map of Europe (Figure 5) or the Eastern United States (Figure 7), one can easily pick out libraries with extensive holdings, but one sees mainly purple markers, which mark libraries that hold 1–5 copies. In the US in particular, the major rare book libraries like the Huntington and Folger hold many copies, but one can also find copies in such cities as Gainesville, FL; Grinell, IA; Baton Rouge, LA; and Bethlehem, PA. While the dense distribution of holdings in the UK and Europe can be largely explained by Cavendish seeding her work with friends and in university and college libraries, the wide and scattered distribution of books in North America has, I hypothesize, a different origin. Surviving copies of her work, as the chart shows, are quite plentiful, and Cavendish’s works (apart from her biography of her husband) were not widely studied before the 1980s; the wide distribution of her books outside major rare book libraries may indicate, therefore, that for much of the twentieth century her books sold cheaply at auction, and could be picked up even by libraries without extensive rare book acquisition budgets. Figure 8: “Sortable Chart” tab, sorted to see libraries that hold the 1656 Nature’s Pictures. Finally, the “Sortable Chart” tab contains the same data as the “Locations Chart” sheet, but allows researchers to sort the data in each column for their particular research needs. For instance, if one were planning a research trip to Ireland, they might sort by “Country” to more easily see which Irish libraries hold Cavendish texts, or if one were editing her Nature’s Pictures they could bring to the top only those libraries holding copies of that book (from 1656 and 1671, respectively). We hope that this chart is useful for enabling more bibliographical and editorial work on Cavendish’s texts, and are eternally grateful to the many, many librarians who helped us chase down copies, exorcise “ESTC ghosts,” and check stacks on our behalf. Please do not hesitate to be in touch with me if you have changes to suggest or know of a holding not on the list—and we hope you enjoy exploring this data! Blake, Liza. 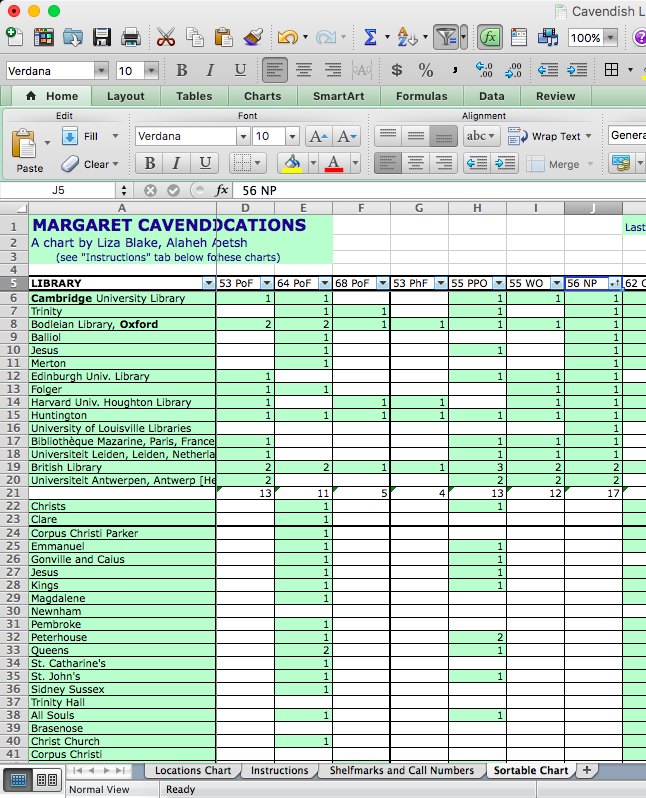 “Locating Margaret Cavendish’s Books: Database, Map, and Analysis.” Digital Cavendish Project. 14 November 2018. 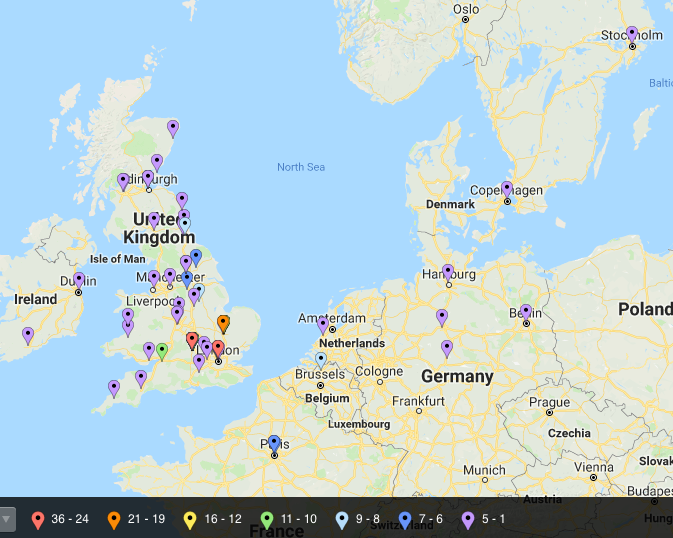 Last updated 25 February 2019. digtialcavendish.org/locating-margaret-cavendish.org. Liza Blake is an Assistant Professor of English at the University of Toronto, working on the intersection of literature, philosophy, and science in early modernity. She has co-edited the collection Lucretius and Modernity and the scholarly edition Arthur Golding’s A Moral Fabletalk and Other Renaissance Fable Translations, and has published in the journals postmedieval and SEL. She is currently a long-term Fellow at the Folger Shakespeare Library, working on a project entitled “Choose Your Own Poems and Fancies: An Interactive Digital Edition and Study of Margaret Cavendish’s Atom Poems.” Her online edition of a fully collated Poems and Fancies, with textual notes, can be found at https://poemsandfancies.rblake.net/.